Are you looking for exceptional family dental care? Finding the right dentist is the best way to ensure your long-term dental health. At Galt Family Dentistry, we understand that you have many options to choose from when searching for a dentist—that’s why we’re committed to providing quality care and excellent customer service that sets us apart from the rest. Our skilled dentists and caring, knowledgeable staff have been serving the Fort Lauderdale area for more than 39 years. We’re conveniently located at 3343 NE 33rd Street, Fort Lauderdale, FL 33308, near a public transportation route. Our practice is in the North Beach Restaurants and Shoppes, where you’ll find convenient parking right in front of our office. Open on Mondays, Wednesdays, and Thursdays from 9:00 a.m. to 5:00 p.m., on Tuesdays from 8:00 a.m. to 6:00 p.m., and on Fridays from 8:00 a.m. to 5:00 p.m., our office provides appointment times to suit your family’s schedule. We also welcome walk-in patients and strive to see them as quickly as possible. When a dental emergency strikes, same-day appointments are available during our regular office hours for patients with urgent needs. We embrace diversity and have bilingual team members who are fluent in English and Spanish to accommodate our patients from multiple cultural backgrounds. Call us today at (954) 302-7410 or book an appointment online. 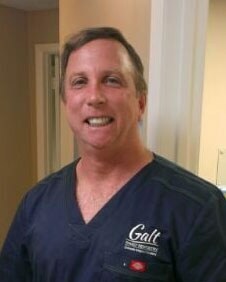 At Galt Family Dentistry, our goal is to become your family’s convenient local dentist office. We provide full-service dentistry, so you can count on us for all of your routine and preventative treatment, as well as cosmetic procedures. Our skilled Fort Lauderdale dentists provide general dental services and cosmetic dentistry to all ages of patients, including children from the age of seven. We’re committed to helping you preserve your dental health, offering oral cancer screenings, professional cleanings, restorative procedures like crowns and fillings, and other routine dental services. Our experienced hygienists work to educate patients on how to keep their smiles sparkling at home. Patient comfort is one of our top priorities at Galt Family Dentistry, so we work to create a calming atmosphere that can help anxious patients relax. Our gentle dentists truly care about our patients, taking the time to speak with them about their dental health goals and how they can be reached. We feature the latest technology, such as intraoral cameras, digital radiography, electronic patient records, and a partial lab for simple repairs. Every treatment area has a television, allowing patients to relax while undergoing dental treatment. Many patients come to us hoping to improve the appearance of their teeth. We offer options for aesthetic enhancements, including full-mouth reconstruction, veneers, and Invisalign® aligners. If you wish to brighten your smile, we offer take-home and in-office teeth whitening services that can improve your smile’s radiance. Our outstanding dentists will devise a treatment plan that will restore your smile and confidence. At Galt Family Dentistry, we believe that maintaining your dental health shouldn’t be a burden on your family’s finances. In addition to accepting many major dental insurance providers, we also provide flexible financing and take the DentRite® discount plan. You’ll also enjoy cost savings throughout the year on some of our most popular dental services. We’re committed to helping you get affordable family dental care, so please consult with our helpful staff members if you have any questions regarding financing or payment. Call us at (954) 302-7410 today to schedule your appointment or book an appointment online. Dr. McHugh is committed to treating each patient with kindness and respect from the moment they walk in the door. She takes extra time to understand her patients’ needs by listening to their concerns and doing what is best for their dental health. Dr. Pyser recognizes that no two situations are alike. Like a snowflake, each of his patients are completely unique and require different approaches to treatment. Tired of traditional dentures that slip and slide? Our dentist in Fort Lauderdale offers implant-supported dentures that allow you to keep your teeth permanently in place.